To be honest, I didn’t always get to eat all of my own desserts, since I try to give them away or used to take them into my office to pawn them off onto my coworkers. But now that I work from home full-time, I am my own coworker..so I can sneak one (or three) of them as a second breakfast and no one is judging me/watching me/helping me eat them. What I’m saying is, you NEED to make these vegan lime bars and take them to your work and give them to your lovely co-workers, do it for me! 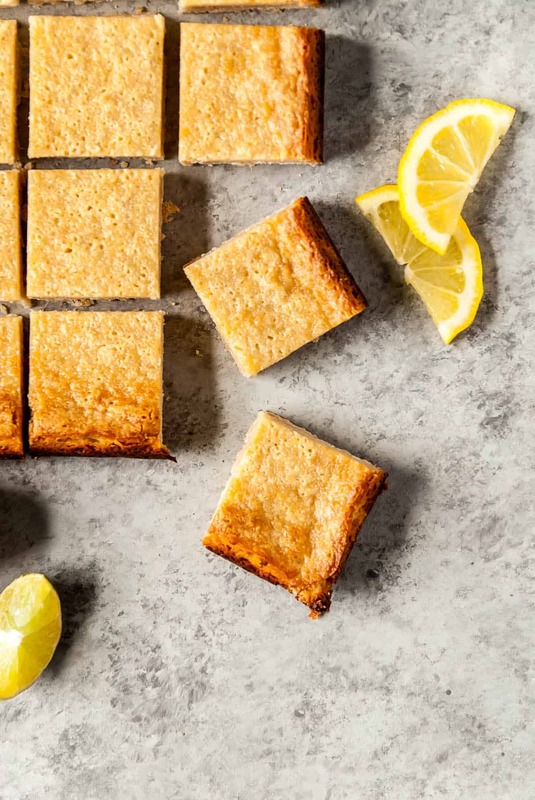 The one thing that I LOVE about these lemon vegan lime bars is that between the crust (vegan shortbread crust magic) and the filling (like I said, my FAVORITE EVER), they are a perfect mix of sweet, tart, and just easy enough. The filling comes together in the blender while the 3 ingredient crust bakes just enough to handle the filling. The filling is less of a classic lemon bar texture and more of a creamy/dreamy cheesecake-like texture that also tastes like a lemon-lime bar. The cashews lend a perfectly creamy texture while the coconut oil holds everything together and the citrus makes for a perfect punch of flavor. Like I said, favorite bar filling ever. Now for the tips and tricks! These vegan lime bars are kind of hard to mess up, but it’s going to be tempting to skip steps to make them go faster. Trust me, you don’t want to do this. They are perfect the way they are! Make sure you prebake the vegan shortbread crust! Not prebaking is going to cause the filling and crust to meld together in a weird blob and won’t have a good result. Also, don’t overbake the crust. You are going to want it to still look slightly pale, but solid enough to hold up to the filling. I haven’t made the crust gluten free, but I’m guessing that replacing the flour with a 1:1 baking mix would work perfectly fine. You may have to increase the coconut oil a little bit to get it to stick together. Please let me know if you try this! The filling should be smoooooth when you blend it. You want a creamy, cheesecake-like mixture here. If you don’t have a Vitamix or Blendtec, make sure you are soaking your cashews for at least a few hours before blending. Let them cool and chill all the way! They will fall apart if you try to cut them when they are still warm. Vegan lime bars are dreamy, creamy, and have a PERFECT shortbread crust! Made with a creamy cashew filling and a coconut oil crust that will TOTALLY become your new favorite dessert. Preheat oven to 350 degrees F. Line an 8×8 square pan with parchment paper and lightly grease. Set aside. In a medium bowl, whisk together the flour, coconut oil, and powdered sugar. Press into the bottom of the prepared pan. Bake for 9-10 minutes, or until the crust starts to turn a light golden brown and is solid to the touch. Set aside while making the filling. To make the filling: Combine all of the ingredients in a blender and blend on high until the mixture becomes smooth. Pour onto the pre-baked crust. Bake for 40-50 minutes, until the filling only jiggles slightly and the top is golden brown. Allow to cool at room temperature for at least 30 minutes and then chill in the refrigerator for at least 2 hours before serving. Pinned to vegan ! Love the idea ! Thank you ! We don’t have Zevia Dry Lemon Mixer in Canada. Suggestions? Hi Loraine! You can use any other bubbly drink that is lemon flavored!